Join us for the last SAEN River Talk of the season! Bar service will be available along with snacks and there will be draw for salmon flies tied by SAEN members! All are welcome. It's just around the corner on May 4th. Don’t miss out! ​There's still time to buy tickets before they're gone! The Salmonid Association of Eastern Newfoundland (​SAEN) is a volunteer, non-profit organization dedicated to the conservation and wise management of our trout and salmon resource. 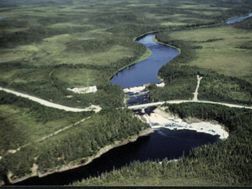 We are located in Newfoundland and Labrador, Canada, one of the best fishing and fresh water areas in the world. This web site provides useful information about our goals, conservation efforts, recreational fly fishing, SAEN activities and the various projects that have been undertaken by our organization. ​Everything you need to know about our organization. Our many activities and events we hold every year. Have a question or comment? Please use our contact form to get in touch with SAEN. SAEN ATTENDS DFO TECHNICAL BRIEFING ON STATUS OF ATLANTIC SALMON IN NEWFOUNDLAND AND LABRADOR. Trailer for a Two-Part Series SAEN Is "Releasing" This Year. Support us today to help us reach our goals.